kelbysews: 10 Down, 20 to Go! After much cursing, pricked fingers, and hunched shoulders, I finally finished these 10 wristlets for the bazaar in October. 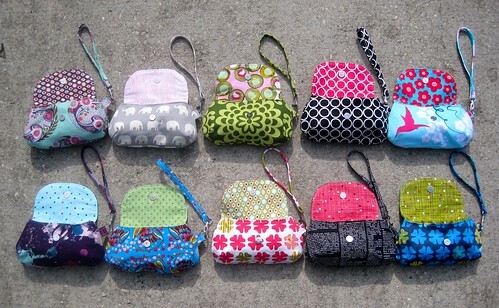 I would like to make 20 more pouches--10 large boxy bags and 10 zippered pouches--so I still have a lot of work ahead! These are from one of KeykaLou's patterns. I chose the smallest size, but when I went to top stitch these, I regretted it! Teeny tiny things just aren't my forte! 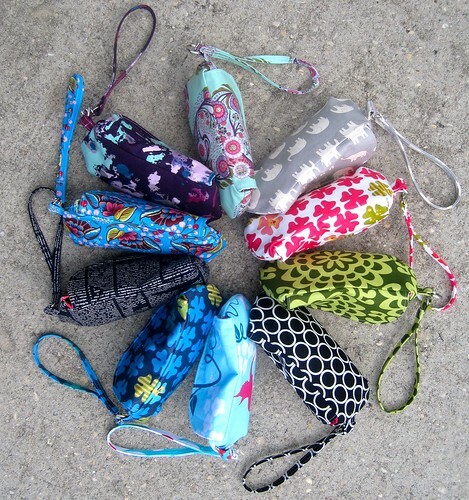 Cute little pouches - pity about the fingers! They dont look small, how small are they? I love them! I think you did an excellent job on choosing the fabric for these. but they are so darned cute!!!! They look great. Good luck with your task, you are a better woman than I for attempting all that! Great job! I've also made these in bulk for sale, in the baby size, and the topstitching is a pain, but my machine's arm is the right size to let it just hug the arm while I guide it around.